Somewhat related to Shipping luggage from Narita Airport to Haneda Airport and storing it there, but not quite. We arrive Haneda at 4:45am. We depart Narita 6pm. We have 4x large suitcases (we're a family with 2 young kids). We are on a single JAL itinerary the whole way, but have been told they do not arrange luggage transfer between airports. Ideal world: We hand our bags to a luggage company at Haneda around 6am. Later that day, we pick them up (around 3pm) at Narita, and check in for our next flight. This way, we can explore Tokyo for the day instead of lugging our suitcases all over hither and yon. Is this possible? I've found some info on TA-Q-BIN and 'Hands Free Travel', but none of them are 100% clear on whether same day is possible. Certain pages say there is a 2-day minimum advance requirement for airport-bound luggage. Other pages specifically hint at same-day delivery. Our alternative plan is to limobus ourselves all the way out to Narita, then store/check our luggage and immediately turn around & get back into the city, but that feels like a waste of precious time in a city! There is no way to ship your luggage between Haneda and Narita airports in such a short delay. Shipping companies require at least two days to do so. If you can get to Tokyo Station with your luggage before 11AM, you can bring your bags to the Sagawa Tokyo Service Center. From there, they offer same day shipping to Narita. The service is offered in English, Chinese and Korean and is also available at Shinjuku and Asakusa. Keep in mind that this will set you back around ¥2500 per bag (25 USD) so it can get expensive quickly. It will however be the most convenient option as you wont have to carry your bags in the Narita Express train. While not perfect, you can store your luggage in a storage locker in any of the main train stations in Tokyo. 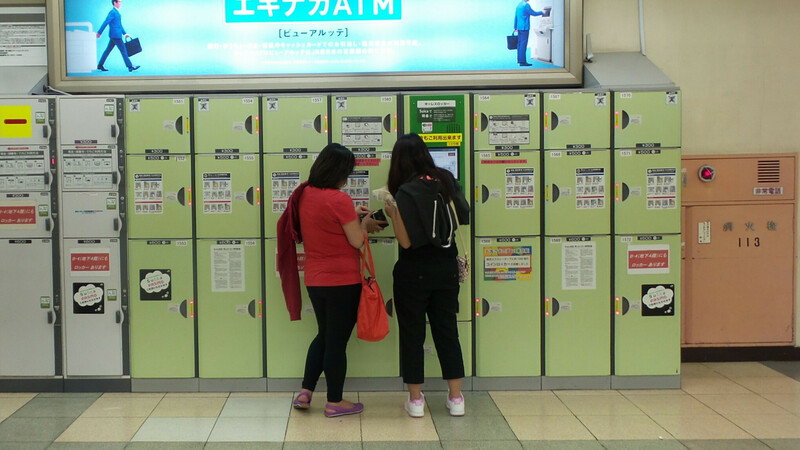 Look for the following or ask the station attendant for coin lockers (コーナーロッカー). In my opinion, this is your best bet. It's easily accessible from Haneda airport via the Keikyu-Kuko Line. You can then depart towards Narita airport using the Narita Express train. No transfers between lines with luggage. The downside is that Shinagawa station isn't located in "central" Tokyo and you will most likely need to take another train/taxi/bus to go towards the main sights. While not quite as easy as Shinagawa Station, Tokyo Station is still a solid choice. You will need to transfer once (either at Shinagawa or Hamamatsucho stations), but once there, you are in the heart to Tokyo. When you are ready to leave, you can take the Narita Express train directly to Narita. The Narita-Haneda limousine bus is ¥3100 and takes between 65 to 80 minutes, add ¥2820 and 1 hour to return to Tokyo Station and the return trip to go back to Narita in the afternoon and you will be looking at ¥8740 (around 85USD) and 3 hours of transit time, and that's only for 1 adult! Not the answer you're looking for? Browse other questions tagged luggage japan nrt hnd or ask your own question.